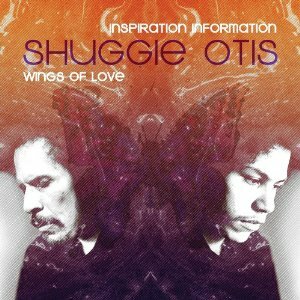 Album Review: Shuggie Otis "Inspiration Information/Wings of Love"
The most mysterious figure in soul/funk shows us what he’s been up to for…oh, the past 40 years. If you think soul singer D’angelo’s thirteen (and counting) year absence from record making is bad, consider the case of fellow soul brother Shuggie Otis. Although Otis never had the commercial impact that D had, the singer and multi-instrumentalist was highly regarded. His talents were appreciated so much that The Rolling Stones offered him a position in the band-that would eventually be filled by Ron Wood (Otis respectfully declined the invitation.) Shuggie released three albums in the Seventies that, while critically acclaimed, didn’t exactly set the charts on fire. Then he disappeared for three full decades.. The re-release of Shuggie’s last album, 1974’s Inspiration Information, rekindled interest in the musician shortly after the new millennium began, but he soon disappeared again. Now, 40 years after its original release, Inspiration Information enjoys yet another reissue- this time as part of a 2-disc package including Wings of Love, an album containing material Shuggie worked on between 1975 and 1990, with one additional track recorded a decade later. If you are a fan of Seventies soul and funk, and don’t own Inspiration Information in any of its incarnations, now is your chance to correct this oversight. While slightly more esoteric than the music Stevie Wonder and Sly Stone were making around the same time, there are definite parallels to be found in Shuggie’s music. It boggles my mind that songs like Inspiration’s title track and the chugging “Aht Uh Mi Hed” weren’t hits, as they would have sounded perfect next to “Higher Ground” and “If You Want Me to Stay” on the radio. This set is padded out with four previously unreleased tracks, all of which fit right into the original album’s vibe. While Shuggie might be best known as a guitarist, much of Inspiration (including the excellent instrumental “Pling!”) is centered around experimentation with the Rhythm King, an early drum machine. While that may date the material, it certainly doesn’t make it sound any less funky. Wings of Love proves that while Otis may have disappeared from releasing albums, he didn’t stop recording music. More importantly, he didn’t stop recording good music. Some songs are a direct progression from the sound of Inspiration Information. “Special,” the album’s opening track, plugs right into the uptempo pop/funk of Prince’s first two albums (Otis definitely shares a creative kinship with the Little Guy from Minneapolis,) while “Tryin’ to Get Close to You” is a close relative of “Strawberry Letter 23,” the Otis-penned song that became a hit for The Brothers Johnson in 1978. Shuggie flexes his ballad skills on “Walkin’ Down the Country,” which suggests the influence of vocal groups like The Stylistics or The Delfonics, mixed with the symphonic pop of Burt Bacharach. Otis never gave up on the Rhythm King, but his guitar skills shine a little brighter on this half of the set, culminating in Wings of Love’s 11 minute-plus Hendrixian title track. Even though some of Wings‘ tracks fall into regrettable ‘80s production tricks, they’re still more than worth listening to. As evidenced by his recent performance on Late Night with Jimmy Fallon (with house band The Roots) and interviews with magazines like Wax Poetics, Shuggie’s never lost the fire in his belly or his music-making acuity. One hopes that the release of Inspiration Information/Wings of Love signals not only a broader appreciation, but a new beginning, for an artist way ahead of his time.